If someone hires you to paint a fence and then hires you to paint a second fence before the first fence is even finished, it either means that you’re doing an exceptional job painting that fence or it means that the fence is a metaphor and you’re making a movie for Marvel Studios. It could even mean both, but this metaphor is already pretty strained. Either way, that’s the situation James Gunn has now found himself in, since Marvel has already enlisted him to write and direct a sequel to his talking raccoon movie Guardians Of The Galaxy, which isn’t even out yet. This isn’t particularly surprising, since Guardians has been riding a pretty solid hype train for a few months now, but it is a strong indicator of Marvel’s confidence in Gunn’s film. Also, for all we know, Guardians Of The Galaxy 2 could be what Marvel plans to release on May 4, 2018. Now the only question is how Gunn will be able to top his first movie—which, of course, we haven’t seen yet. 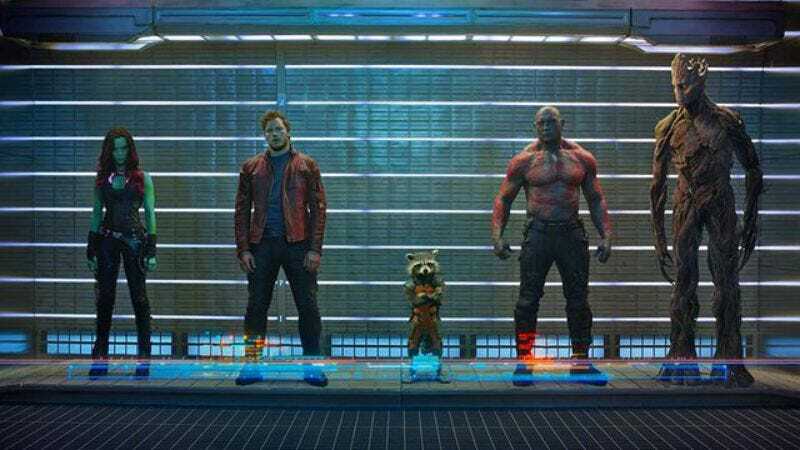 Maybe Guardians will introduce a fun catchphrase for Bradley Cooper’s talking raccoon—something like “Rocket away!” when he wants to duck out of a hairy situation—and then Guardians 2 will have a twist on that, where some other character says it as a joke. Maybe it will have two talking raccoons, two talking trees, and two actors from Parks And Recreation. Jim O’Heir would probably be a fantastic intergalactic superhero.